Discussion in 'Reviews and Articles' started by Lord Kain, Jul 7, 2008. 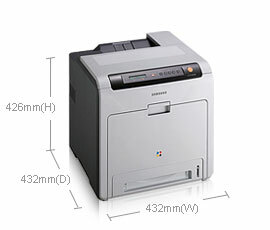 Today we are looking at one of the best printers Samsung had to offer: the CLP-610ND color laser printer. Furthermore, here’s a link from Samsung’s website for more details on the features and specifications. The first thing I realized when the UPS guy asked for help when he knocked at my door with this item was that with such a huge box, the CLP-610ND must be a behemoth! Maybe it’s a tad bigger than other similar printers I have tested from other companies, but it’s a good compromise since this printer is built solidly. The plastic casing is sturdy, compared to some printers with a cheap, light front panel that makes you cringe every time you open it, in fear of a tear down. I was especially surprised with the quality of the drivers shipped with the machine. I had options to install the printer on my 64bit operating system right out of the box. Also, the driver panels are easy to navigate and intuitive. It’s quite easy to find the toner meters, which are accessible with one click. I occasionally waste time at work with new HP drivers / software, searching my way through many layers of bloat and eye candy. Kudos to Samsung for opting with order and simplicity, which is expected from a small-business oriented machine. Lastly, I also congratulate the company for enabling the duplex mode by default, as an environmental-conscious borderline “gen X / Y” young man. I must say that I tried the printer with a USB 2.0 cable (which are never included with printers ) on a single computer. It would have been nice to try it on a network, plugged with an Ethernet cable, but I’ll leave that task to a fellow reviewer. However, considering the great drivers provided, I’m fairly confident that this feature is as well implemented as the others. When starting a printing job, this printer must return to this world from its deep slumber, probably to respect the energy saving standards. It took between 10 and 20 seconds to start when in sleep mode, after a while of inactivity. When sending successive print jobs, there was next to no delay. I must say that this feature could be a letdown for trigger happy users that are used to printers that starts right off the bat (as many HP printers that I tried), but the speed obtained afterwards is a good compensation. With my tests, I reached 21 pages per minute with full color pages on normal quality (Samsung announces up to 25 on its site). Of course, it’s a little slower with the duplex mode, but if it’s to save the environment, I’ll take it! The 2500 pages capacity (black) and 2000 pages capacity (color) of the toner cartridges suggested by Samsung was pretty accurate. I managed to print a little more than 2000 pages until I got the low toner alert, and my pages were very heavy on graphics and pictures. With text, I’m sure I would have done more than 2500 pages. Ah… and no damn paper jams during all my tests, which is another good point. The quality of printing was impressive for a sub-1000$ printer of this category. The pictures I printed had an excellent, crisp definition, though I must say that I had to adjust the color output manually. I needed to decrease the magenta slider in the drivers to get more realistic colors, otherwise my images printed too dark. For a price of around $400, Samsung's CLP-610ND is a great choice for a small business or an enthusiastic home user (or serial printer). It offers astounding quality for its category, works straight to the point, without useless features or crammed component like a scanner, a satellite dish or a toothbrush, like many of the multifunction printers on the market.